Gift Certificates are the solution when you’re not sure which item is the perfect gift. • Order as many Gift Certificates as you would like us to send to the same address on a single order. Please place separate orders for Gift Certificates to be sent to different addresses. • Gift Certificate amounts are in US dollars. • If you want the Gift Certificate shipped directly to the recipient, please fill out their name and address in the Shipping Address section of checkout. Otherwise, the Gift Certificate will be sent directly to you. • We do not personalize Orion Gift Certificates with the name of the recipient. • The Gift Certificate will be sent with the purchaser's name and personal gift message. • There is no tax or shipping charge on certificate orders sent through Standard Delivery. • No discounts may be applied to purchases of Gift Certificates. • Gift Certificates are not redeemable for cash. • Gift Certificates have no expiration date. Gift Certificates will be mailed via first-class mail along with a current Orion catalog the next business day after the order is placed. Please be certain to include your billing address as it appears on your credit card statement to avoid delays. Allow 3-5 business days for delivery. Expedited shipping options 2-day, 3-day, or overnight delivery — are available for sending Gift Certificates at an additional charge. 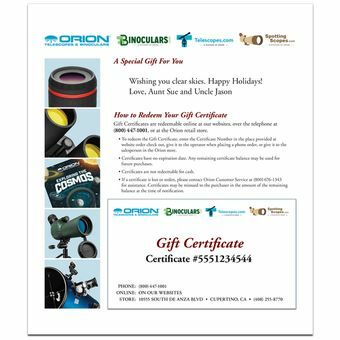 • Gift Certificates are redeemable online at www.telescope.com, over the telephone at 800-447-1001, or at Orion retail stores. • Gift Certificates have no expiration date. Any remaining certificate balance may be used for future purchases. • If a certificate is lost or stolen, please contact Orion Customer Service at 800-447-1001 for assistance. Certificates may be reissued to the purchaser in the amount of the remaining balance at the time of notification.